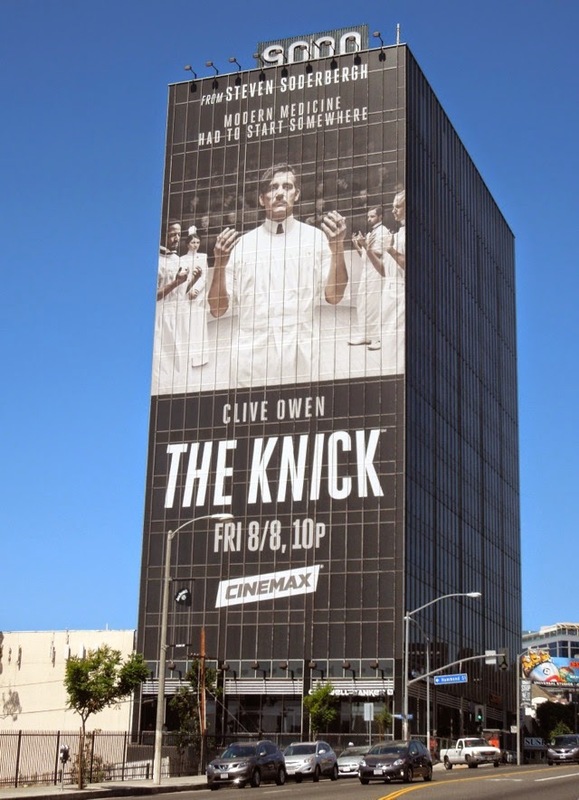 The last time Clive Owen was spied in the skies of L.A. it was as the brand ambassador in these Three Olives Vodka billboards, but this time the British actor is back for a brand new TV show on Cinemax, The Knick. 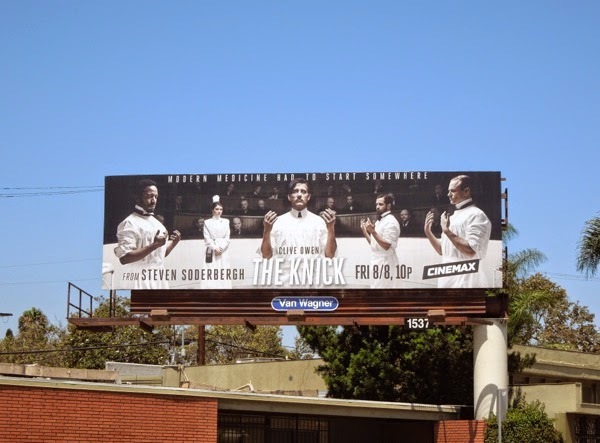 He stars as 'Dr. 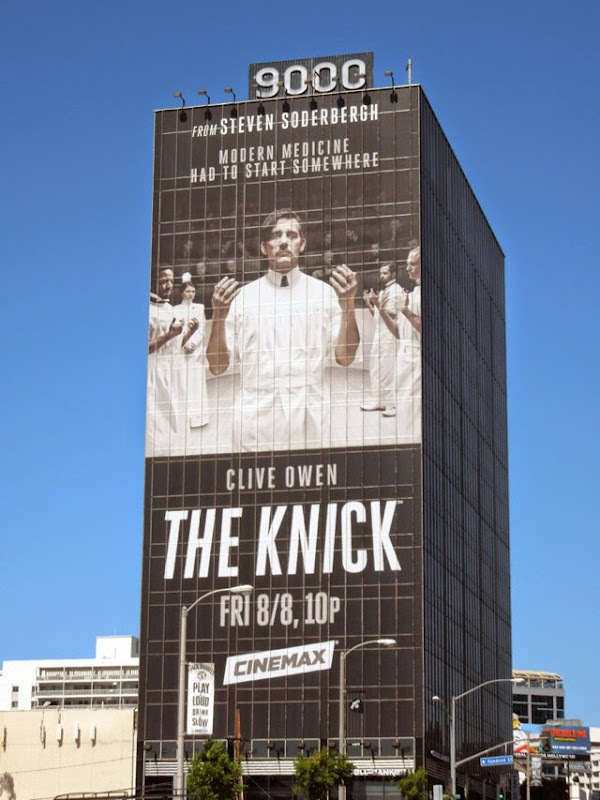 John W. Thackery' unlocking the secrets of modern medical techniques at the start of the 20th century at New York's Knickerbocker Hospital in Stephen Soderbergh's new drama. 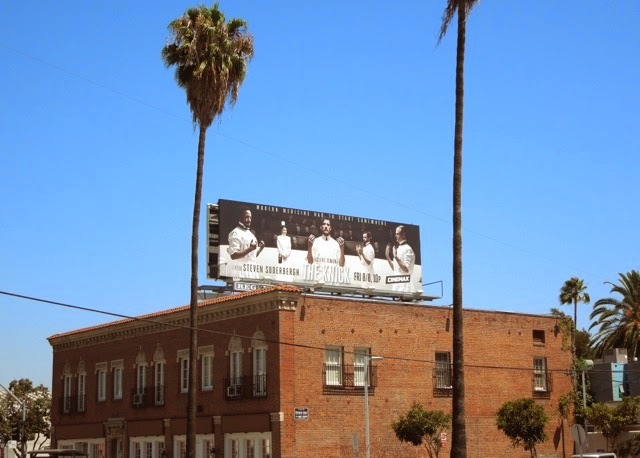 The new series follows the lives of the groundbreaking doctors and nurses as the push the boundaries of established medical practices, with high mortalities and the absence of antibiotics. 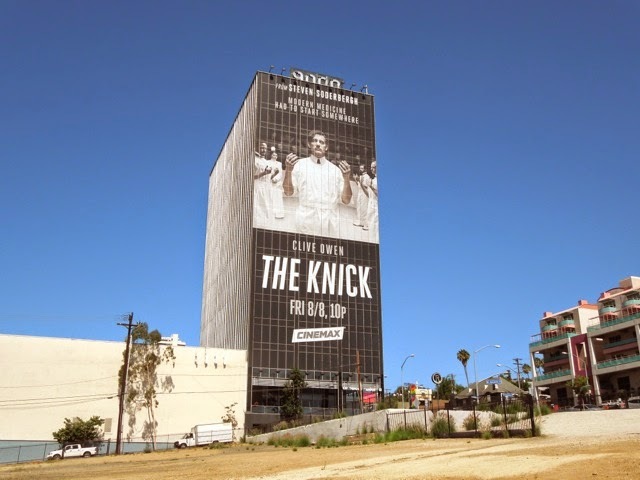 There's something about this stark clinical creative which looks futuristic, even though it's set in the past. 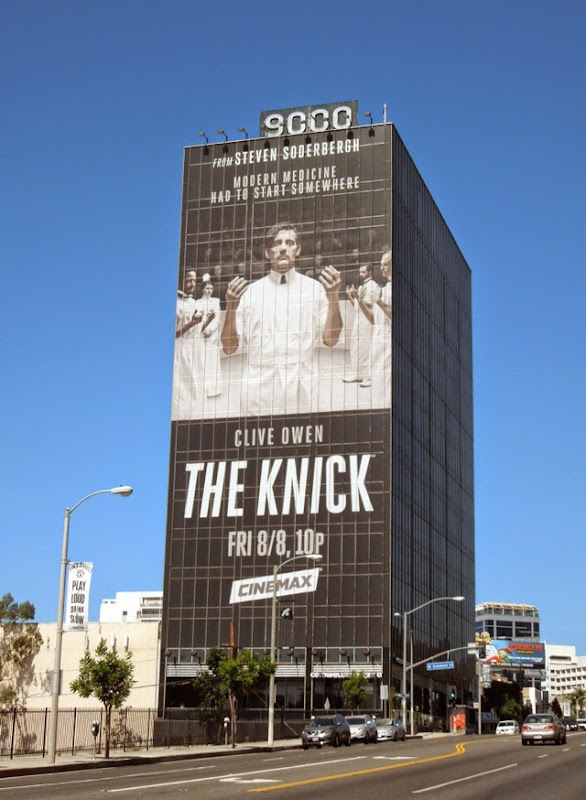 It's almost like a scene from Terry Gilliam's 1985 Brazil movie, and maybe that's because the techniques trialed then may have seemed outlandish and extreme at the time. 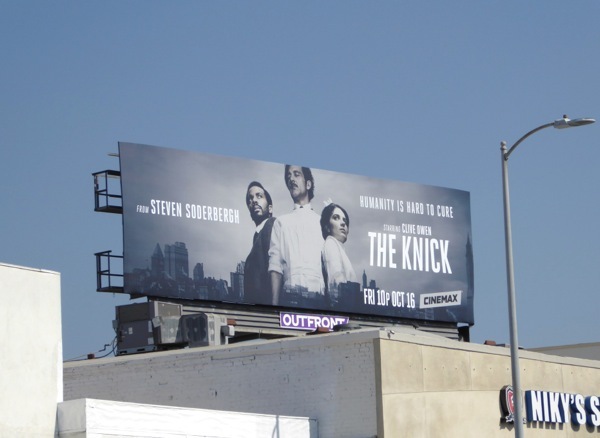 The standard landscape billboards for the series debut of The Knick were first spied along Sunset Boulevard and Melrose Avenue on July 8, 2014. 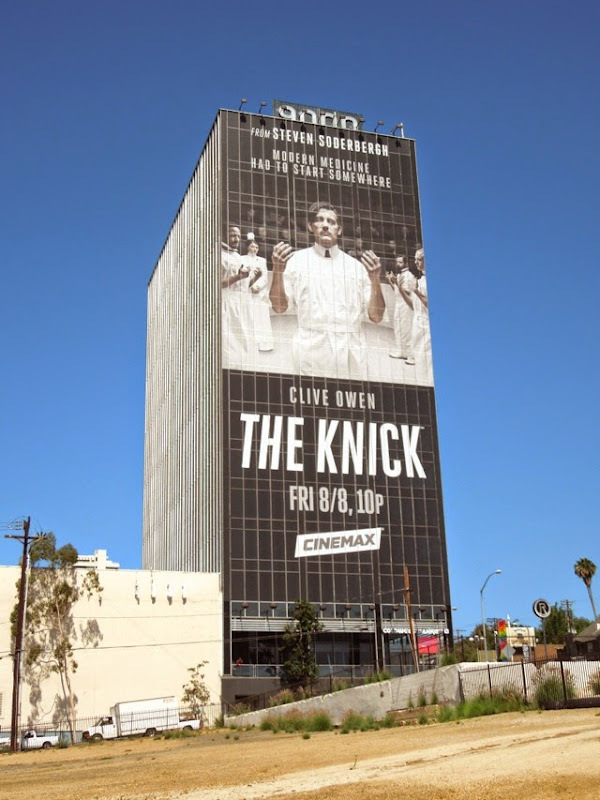 Meanwhile the spectacular super-sized Cinemax creative was snapped towering over L.A.'s westbound Sunset Strip on July 11, 2014 (which should make Clive Owen fans sequel with delight). 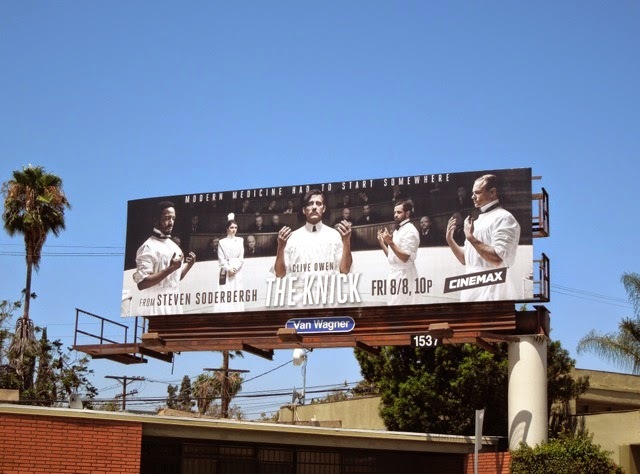 If these outdoor ads tickle your fancy, be sure to check out more Cinemax TV billboards for shows like Banshee, Strike Back and Hunted. 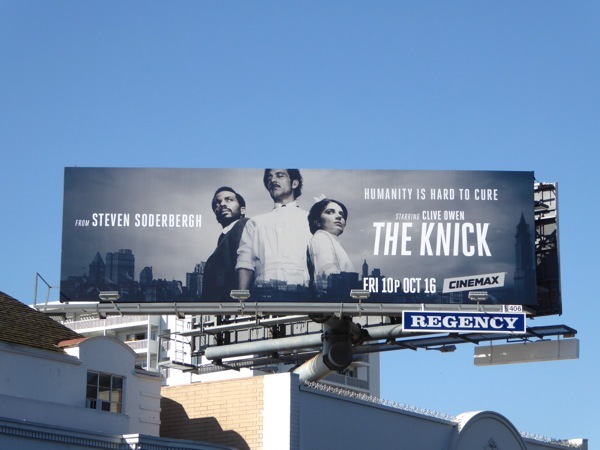 Let's hope this new medical drama series will be as pioneering as the methods discovered during the time period and not just a bloody mess. 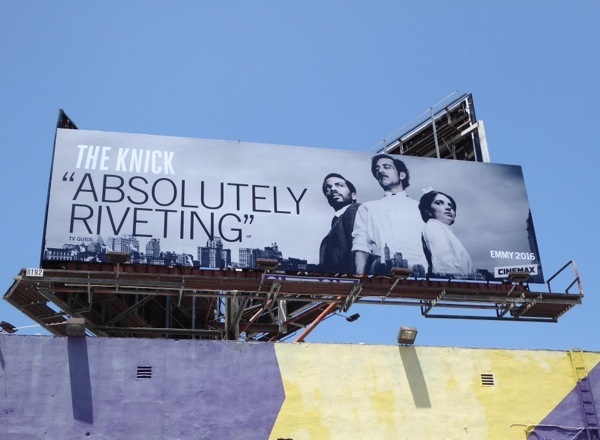 And get ready to enjoy another TV WEEK full of this season's billboard creatives for the newest shows and returning favourites in the days to come. 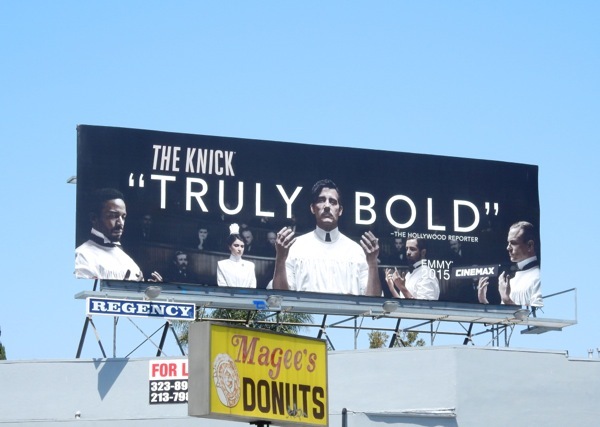 UPDATED: Here's also an amended "Truly Bold" first season ad creative for The Knick's Emmy consideration campaign. 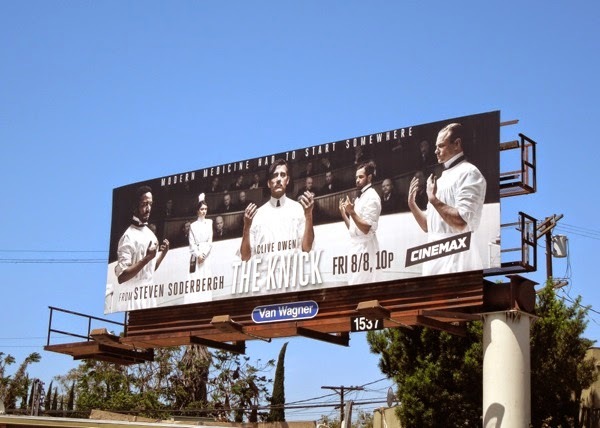 These striking billboards were snapped along La Brea Avenue and Pico Boulevard on May 20, 2015, and are part of sister channel, HBO's cohesive 2015 Emmy Consideration outdoor ad campaign, so be sure to check them all out. 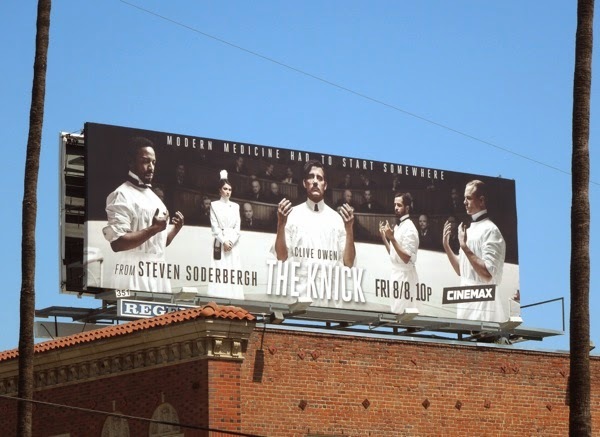 UPDATED: If you're a fan of the acclaimed period medical drama set in New York City, here are the season two billboards from around the streets of L.A.
André Holland, Clive Owen and Eve Hewson are back to deal with problems of substance abuse, race, romance and typhoid at the turn of the century, all the while continuing to be pioneers of surgical and medical practices. 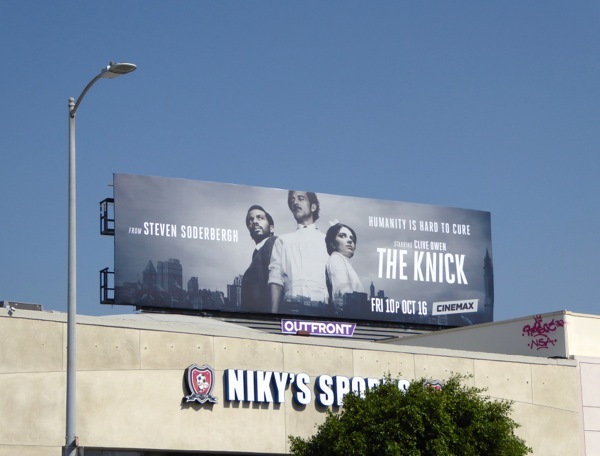 These black and white sophomore season billboards were first spied along Santa Monica Boulevard in West L.A. on September 23, then later above the Sunset Strip in West Hollywood on September 26, 2015. 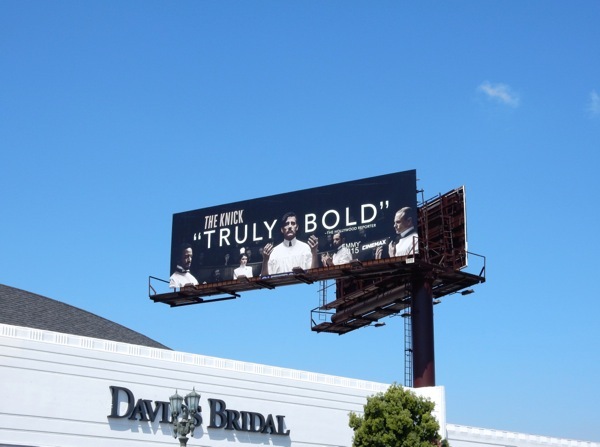 UPDATED: Here's also the season two Emmy consideration billboard for the 'absolutely riveting' series, spotted at San Vicente and Sunset Boulevards on May 27, 2016.